A quick thought from my life before I add my post about more famous Hungarians (and give some song recommendations!). 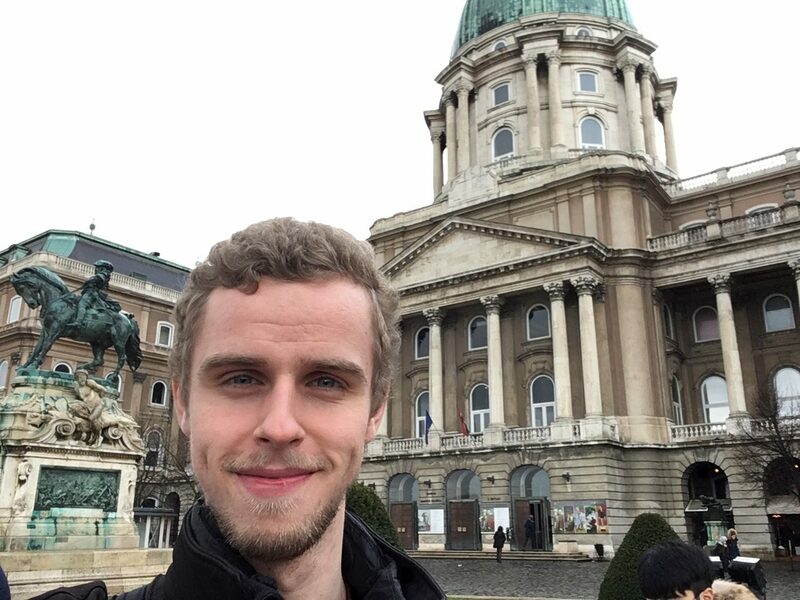 As part of my language school course, we have visited some of the key historical locations in Budapest. 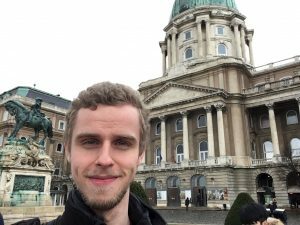 Last week, we took a trip to Buda Castle, a citadel with a long and varied history located on the Western bank of the Danube. Originally built by King Béla IV in 1265, it was the primary fortress of the Hungarian kings for several hundred years. 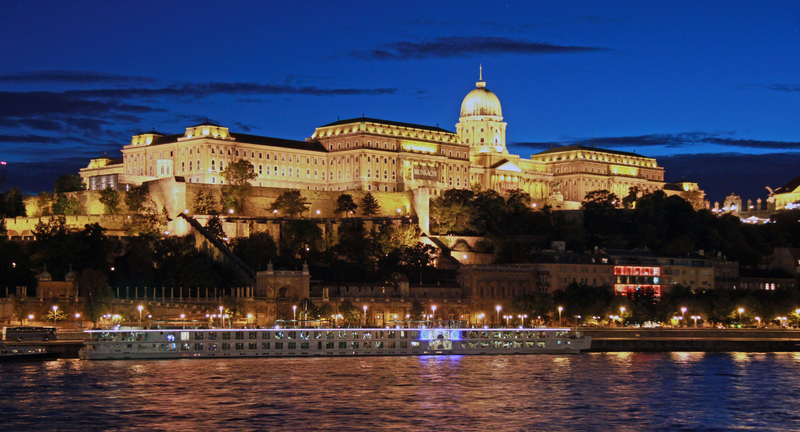 Previously, the kings had traveled with their court from region to region, so the decision to construct Buda Castle ensured that Buda—and later Budapest—would become the center of political power in the country. In the mid-eighteenth century, the castle was rebuilt as a baroque palace, the structure that stands today. The palace is beautiful, but parts of it have seen intense history. 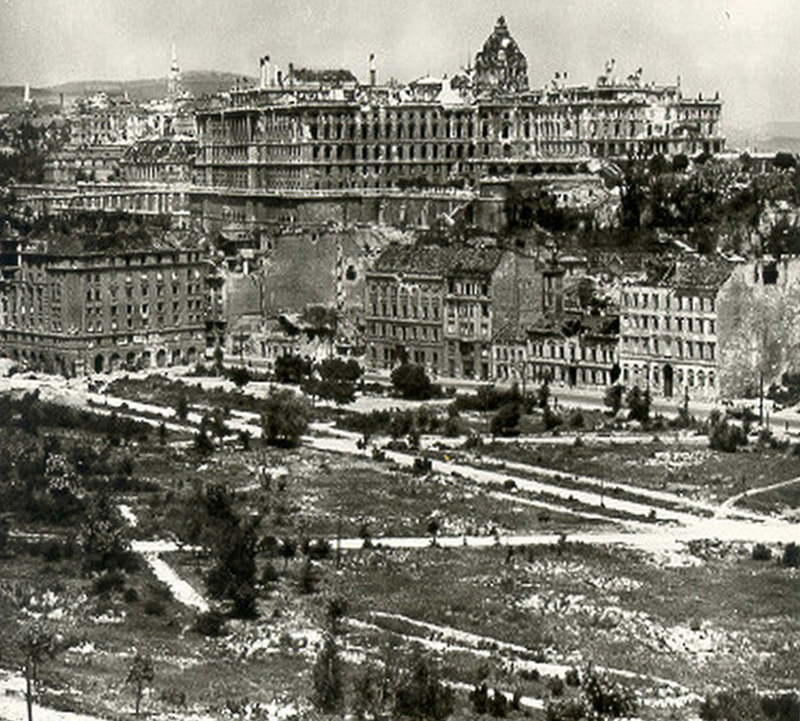 In 1945, Soviets invaded the Pest (Eastern) side of the city. 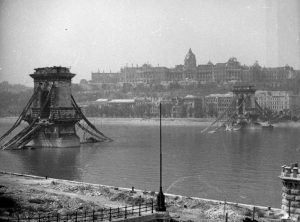 Nazi German and Hungarian troops retreated to Buda and destroyed all the bridges across the river. Over the course of months, the each army shelled the opposite city in hopes of gaining an edge. According to our tour guide, Emese, much of the palace, including a chunk of the ancient castle, was reduced to rubble. Since then, the palace has been restored, but most of the original castle is in ruins that cannot feasibly be put back together. You could see the attempts of some curators in parts of the museum, where stones had been strategically inserted into a room to give the feeling of what the room may have looked like before World War II. But sometimes there wasn’t much. This really got to me. I have not been to Europe before, and also haven’t seen destruction caused by any major war. 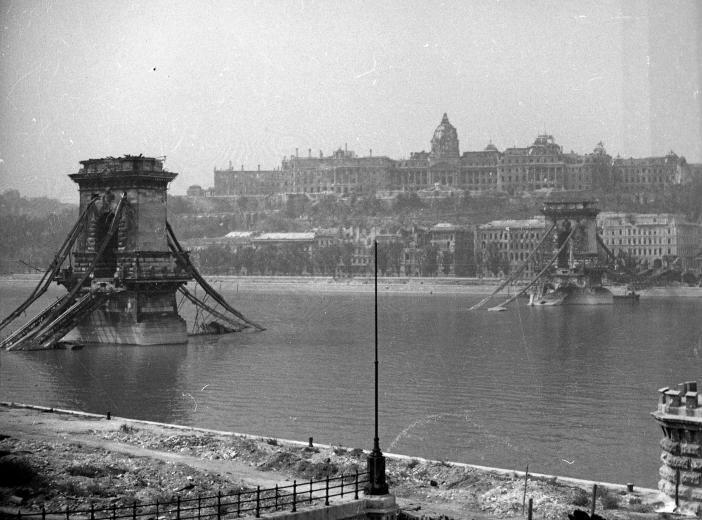 I’ve only studied World War II in school, so it never really struck me how evident and intimate the aftermath of the conflict could be in a place like Budapest, where Russians and Germans fought block-by-block through the streets. Maybe it’s partly because I’m American or Midwestern that I feel distant from violent history. Most of the war history that I was taught happened “over there” in Africa, Asia, or more often than not, Europe. If we studied armed conflict in American history, it was “over there” on the East Coast, except for the war on Native Americans that brought Minnesota into the United States. No place where I’ve lived has been a battleground in a very long time. 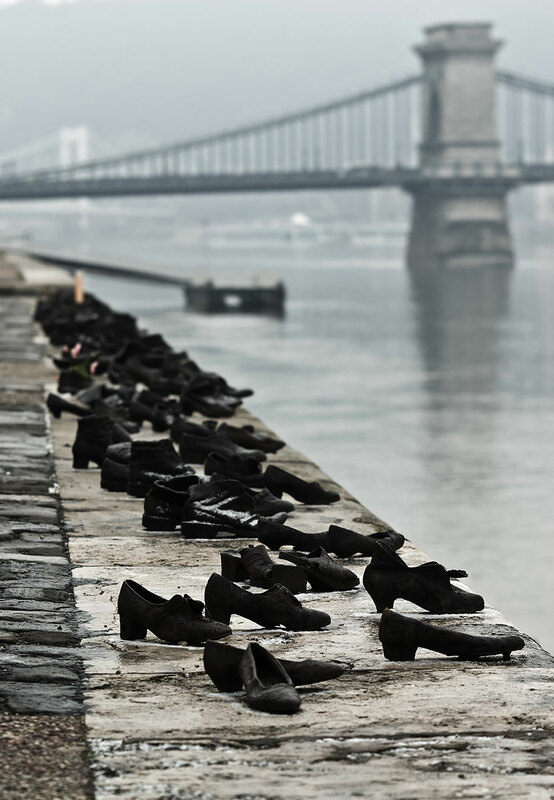 Now, I’m living in a city where its inhabitants live in apartment buildings damaged by bombs in World War II, or by the various protests when Hungary was under Soviet rule mere decades ago. 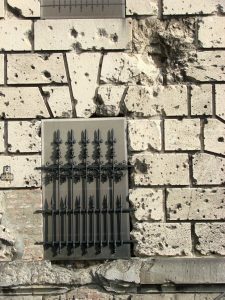 Landmarks like the palace have pictures of buildings and structures that simply don’t exist anymore because of these conflicts. 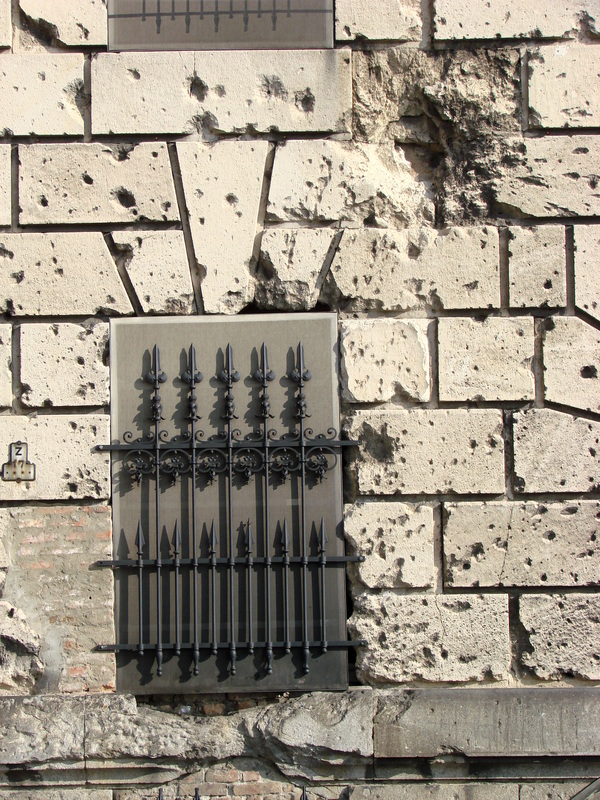 And on the street, one can see the evidence of war every day, not blatant, but visible. 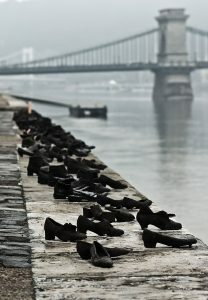 I wonder whether proximity to these remnants of war affects Budapestians on a psychological level. When they see the physical destruction that a conflict like World War II has caused—not to mention unseen psychological and social impacts—do they tend to think twice about policies that could provoke a similar conflict? And have I, as an American and Midwestern, been conditioned to think that even if war happens, it won’t have an impact on my home? It kind of feels that way. I don’t know if any of this has any psychological or sociological basis. (If anyone reading this has an idea, I’d love to hear about any studies or research you know of!) Regardless, living in Budapest and seeing the physical influence of History-with-a-capital-H every day is changing the way I think. I still haven’t seen that much, and I have a long way to go before I feel like I understand the Hungarian mindset and way of life. One thing is becoming more clear to me as I’m here: living in a new country is a culture shock, most often in ways I would not expect. This entry was posted in Uncategorized on January 29, 2018 by nathaniellarson. Such a clear overview of the devastating history and its potential effects on the people of the city as well as on you. Thank you!